I am guessing most of you don't know Hebrew, so I prepared English subtitles for this video which was aired in Israel Ch1 national TV in 24/2/2016. This article was done by Shirly Berkovitch. In the article 2 EHS people , Myself and Meni Benari, present our story, there is a review about EMF and EHS. In addition it covers the high so called "safety standards" and the deployment of WIFI in schools. 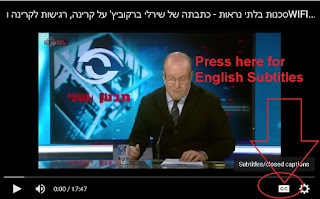 This report was aired few days ago in Israel CH1, main report/investigation program. Making the English subtitles was not easy. But I think it is important that people will understand what really happens in Israeli schools regarding the use of WIFI. In many sites I read that Israel has band the use of WIFI in schools, that is not true, WIFI is deployed in schools all over the country, while the recommendation to use wired network is used to deceive the public.